The Sónar takes place in Barcelona since 1997, usually at the third weekend of June, and is one of the most renowned festivals of Advanced Music and Multimedia Art. It is the largest event of its kind in Europe. The Sónar Festival is one of the highlights of Barcelona's music calendar. The next Sónar will be held in Barcelona from June 14 to 16, 2018. 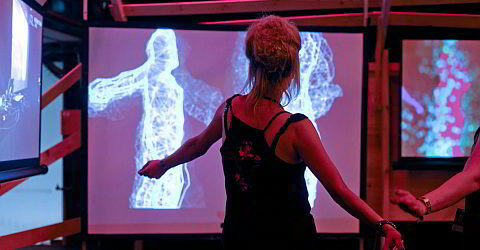 The Sónar combines music and multimedia art, often in very experimental ways. It has reached cult status even among the spectators who are not real fans of this particular music and art scene. Renowned musicians and artists from all over the globe perform at the Sónar and 120,000 people attend it every year. This year, for the 25th Anniversary Sónar brings on stage great Stars as Gorillaz, LCD Soundsystem, Diplo, Richie Hawtin CLOSE, Bonobo, Laurent Garnier and even many newcomer artists have their stage debut. The events of the Sónar by Day take place on the 14th, 15th and 16th of June from 12.00 to 9.30pm at the Fira Montjuic. Sónar by Night takes place on the 14th th of June from 10pm to 6am at the fair grounds "Fira Gran Via L´Hospitalet". Please find the exact timetable on the website of the Sónar Festival. There are three large venues in Barcelona where the Sónar festival takes place. Sónar by Night takes place away from the centre of Barcelona at the fair grounds "Fira Gran Via L´Hospitalet", Av. Joan Carles I (corner of Botánica) in Hospitalet de Llobregat. The SonarBus runs all night long from 8.30 pm to 8.00am from Plaça del Drassanes to the fair grounds. You get to the stop with metro L3 to "Drassanes". From the Columbus Monument at the foot of the Rambla it's a 200 m walk to the stop. For Fira Montjuïc, take the metro L1 or L3 and get off at Plaza Espanya. Alternatively, hop on line L8, S33, S4, S8, R5, or R6. Buy tickets for the Sónar festival 2016 in Barcelona directly on the webpage of the Sónar Festival.